Raúl has forged the border between Mexico and the U.S. so many times that he has the passage down to a craft. “They chase us down in the desert,” he told me. “They put up 25-foot walls, they add airplanes that fly without pilots, they make fences that sting like bees – but we always find a way to get through.” He and his band of indocumentados in our village in northern New Mexico were always regaling me with their experiences, ideas, and opinions. They had pioneered the journey north in tight groups and, upon arrival, called their cousins back at the ejido so they too could launch using the same, now-proven routes. Raúl first arrived in Chimayó in 2002, and in the eight years I was around him, I learned that his breaking point came like clockwork at a year and a half. After that, he would feel like bursting if he could not hug his wife Gabriela, his sons Raulito and Bryan, and his parents. And so he would head south for a few months – only to be challenged once again to retake the walls, hide from the drones, and slither under the electric-shock fences. His choice story about the journey centered on the 25-foot concrete wall that separated the U.S. from Mexico. Dauntless as always, one man hopped onto the shoulders of another, a third onto his back, a fourth onto his, etc.–until the last man reached the summit of the wall. Then, to bring up those at the lower levels, they repeated the action in reverse: instead of scaling the body of a compañero, he who had reached the upper rim pulled the highest man up using a “rope” made of a sweatshirt, then with two sweatshirts tied together the next-to-highest–until finally, using every shirt they had, the man at the bottom. Another time, one dark night under a crescent moon, he jumped a freight train traveling from Tucson, Arizona, into New Mexico, riding the whole way clinging to iron girders underneath a car, enduring the thunder of the engine and screeching of wheels, with grease splattering his body until he turned black. Raúl is an intellect with a philosophical bent. Springing from the near absolute power his government has wielded during the whole of his 30 years, plus the poverty he knows by heart, his insight is Buddhist though he has never heard of Buddha: he believes that suffering reigns in this life and we have to make the best of it by transcending the pain and living a life of meaning. His meaning, as he explained to me, is to fulfill his role as a man; his greatest desire is that his sons grow up to be trabajadores like him. Once, as he was packing a van he had bought to resell in Chihuahua, we decided that, to stay connected no matter which side of the border each of us was on, we would look to the full moon–and feel the presence of the other in its silver reflection. The work that Raúl and his compañero Jorge found was indeed a job, as stipulated by immigration requirements for working legally, that not one citizen of the United States wanted to do: they worked at S. M.´s septic-tank service, sometimes upwards of 70 hours a week. On Sunday they would trundle to the laundromat in Española and sit on plastic chairs while the machines clunked and spun. Then to the Shop ´n Save to buy enough tortillas, tomatoes, hamburger meat, and chiles to last the week. And finally back to the trailer to watch telenovelas. Raúl plots breathlessly. “I’m gonna get a really big truck with double tires and a major CD player.” “I’ll haul fish from Sinaloa to restaurants in Chihuahua.” “I’m ready to bring Gabriela and the niños over and we can live together in a little adobe with a corn field and a rose bush and the boys can go to Chimayó Elementary and learn English and become proud trabajadores like me.” On his paltry salary and given the fact that he sends 90 per cent of it in a southward direction, I can’t see the truck happening soon. Or the fish business. But I can see a family reunion. Others have pulled it off, and given the general lack of toilet paper on the ejido, it’s a viable answer to the dead-of-the-night misery Raúl feels in the trailer with the other guys and the telenovelas reminding them of home. I can also see the potential tragedy. Bristling with Nike knock-offs and American Idol – with the suffering of their father in full view – the new generation grows up to leave the older in the dust. The thought of Raúl hurting because his sons mock the meaning of their father’s life claws at my chest like an eagle’s talon. I send out a plea to friends and friends-of-friends via the Internet. It’s 2003 and one never knows what will fly anymore, but the prospect of helping one family appeals: the bucks roll in. And so Gabriela and the boys take a bus to Nogales. They ferret out a coyote. They set off across the blistering sands. Raúlito has taken on the job of being son-husband-father. He puts on a brave face – but Little Bryan is four and has diarrhea. They sweat. They trudge. The migra/border patrol appears from behind a saguaro like a mirage and marches them back to the border. They sweat and trudge again. The migra catches them again. Bryan’s pants are soiled with crap, and he’s bawling like a lost cat. There’s no place for them to stay in Nogales except under a bush. Gabriela hears about the rapes. They give up, take a bus home, and spend the money on a doctor. To divert his attention from the disappointment, I take Raúl to his second museum: the Museum of International Folk Art in Santa Fe. The exhibition consists of artsy photos of Mexican buses decorated with tricolor banners, plastic statuettes of Nuestra Señora de Guadalupe, and gold tassels reminiscent of shrines, and on the way home I foolishly ask if he’s ever been to a museum in his homeland. He puffs up and proclaims, “Yes, of course.” I ask what they were exhibiting. The silence that ensues goes on a tad too long. No, way too long. After Raúl honored me by asking me to be madrina/godmother to his sons, he came to visit with regularity. It was during these quiet times together that I learned about his early life. He grew up on the ejido San Lorenzo Viejo near Ahome, Sinaloa; it had been established after the revolution as a way to “give back” land to the people. One downside of such redistribution was that formerly indigenous peoples were randomly stirred in with others and eventually lost knowledge of their cultural roots. When we went to the Museo Cultural, Raúl and Jorge spent an inordinate amount of time in front of a map showing the pre-revolution outlay of Mexico’s native cultures, explaining to me that they truly did not know who they were. “Maybe this group, maybe that one” was about as clear as they could get. His parents are Alvino Solís Villegas and Guadalupe Salazar; his father, he proudly related, is ten years older than his mother. At his dirt-floored school he learned both modern skills like reading and writing, and ancient skills like planting seeds with a stick. He danced the traditional steps through the streets of his pueblo and, upon seeing a young woman ten years younger at a cantina, he knew immediately that she was the one he would marry. His first job, at age 12, was selling oranges from the tailgate of a pickup truck. This was a worthy exchange for having to give up school, he explained, as he got to ride in the back of the truck, eat as much citrus as he could devour, and get to know all the pueblos around Sinaloa. Next he assembled seat belts in a maquila at the border and weeded industrial watermelon patches – and, indeed, married the woman he had seen in the cantina. Now he puts in 60 or 70 hours a week scouring porta-potties. And now, due to the devaluation of the peso and the North American Trade Agreement that has supplanted Mexico’s communal corn fields to make way for Fritos´ hegemony, he is part of history: one of somewhere between 12 and 20 million undocumented immigrant workers in the U.S. in the early 2000s. As such, he wears his thinning ponytail under a series of baseball hats festooned with words he can’t read. NYPD. MOUNTAIN DEW. GET A GRIP. Soon after I meet him, he announces in perfect Castilian that he will never, ever deign to speak English. Except for one word he has learned on the job: whatever. Perhaps it is this word that best sums up Raúl´s philosophy. After all, he has forged hundreds of miles in thin huaraches through 100-degree saguaro desert, bedded down with cockroaches and feces, been deported, trudged hundreds more miles in thinner huaraches, been kidnapped by pirates, held for ransom on one-hard-boiled-egg-a-day, and pressed into slavery to pay back the coyote. On one unbearably hot August afternoon in Chimayó, I figure it’s good for such a hero to go over to the waterfall in a bathing suit. You can wade in, stand inches from the river crashing down, inhale a great big breath for courage, and spring through to the other side. There lies a pocket of air just big enough for one person – and once in its sanctuary you can cop a feel of God’s glory. But on this day the river is but a trickle. Raúl and I plop into a shallow pool and, border policy never far from mind, set out to build a symbolic bridge. A miniature rendition of the Santa Fe Bridge linking Juarez to El Paso, it will be. We each know the exact place in the middle where the brass cap marks the boundary – Raúl from a recent enforced journey to the other side of that cap (read: deportation). I stayed in a $14/night motel in El Paso – the kind where the cashier sits on the other side of iron bars – and walked across so I could see what was so important to Raúl’s life. He will build the Mexican side; I, the U.S. The distance between us is a foot-and-a-half. Raúl gets right to work gathering pebbles, twigs, soil, and leaves. I put a branch in place, but I can see right off that I don’t know what I’m doing. He lays the tiny rocks as a foundation, covers this with leaves and dirt, and extends sticks toward the U.S. side. I try to imitate. “Raúl.” The laziness of the river tilts me toward the deeper side of things. “What’s it like being here?” It’s not as if I haven’t been party to the buying of cars without license plates, the telenovelas at the end of the day, the September gritos de libertad, and New Year’s midnight handshakes. But I mean something else. It’s an odd toss-up. The bonds of family and culture on the side of tradition. The solitary rootless person on the side of global capitalism. I want to protest, to insist that tradition and culture are superior, but I myself am a raging sample of what he has now tasted. Until I was named madrina to his children and given entrance into the formal world of Mexican social relations, Raúl and his compañeros didn’t know what to do with me. I, a woman, owned a car. I showed up when I felt like it. I paid for myself. I could drive to El Paso and stay in a motel just to see what it was like. “How is it for you to have me here?” he asks. By now, the Mexican side of our bridge reaches halfway across. The U.S. construct is a tad rickety, but I pat a last finger of sand on to solidify where the two sides meet in the middle. And together we cop a feel of one-and-a-half feet of God’s glory. In 2009 the time arrives for me to tell Raúl that I myself will soon be an immigrant: I am moving to Bolivia. ¡Ay, mi compadre! Poor soul, he harbors the constant possibility of upheaval. A policeman’s glance in the direction of a non-existent license plate. An immigration raid. An accident. He’s not expecting this upheaval. But there it is for all to see: I’m packing my books into boxes. Selling futons and bookcases. Clearly, something is going on. Tears pool, then spill over like the Chimayó waterfall on a big-river day… but NO! Raúl has a better plan. I can move to his house on the ejido in Chihuahua! Live with Gabriela and Raúlito and Bryan in two-room splendor with a boom box that holds 52 CDs at once! He would build me my own room! Not with a dirt floor, but a concrete floor! And, Dios Mio, I’m a woman of a grandmotherly age: I won’t have to work! 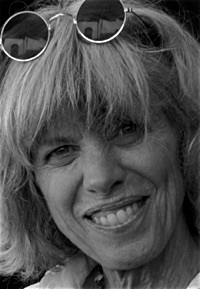 Chellis Glendinning is a psychotherapist and author of seven books. New Village Press will publish her eighth, The History Makers: Meetings with Remarkable Bohemians, Rebels, and Deep Heads, in October 2018. This essay is a chapter in The History Makers. She lives in an antique house in Chuquisaca, Bolivia. View More: Next piece "Xoyatla Is a Proper Noun", Home, Archive. Thank you Chellis – your story reaches deep in my heart. Embedded journalism by a unique agnlosajon hispanicist writing from the view point of an integrated cultural historian. Not only a beautiful personal story; but an impassioned expression of political awareness. I can attest to its veracity having lived for a time in a New Mexican pueblo near the setting of this essay. In these troubled times we need journalism that is authentic, impassioned, and expressive of the personal experience of the observer and the observed –least we forget that personal individual concern is the political meat of society. One way, perhaps the best way, for a journalist to do this is to acquire a deep a sense of place in order to write about it. Like a good diet: We also need vegetables. Gorgeous, humanizing piece. Thank you!